As much as ever, NBA teams value talented and able shooters for the way they can affect the game. That’s just part of why Creighton product Doug McDermott believes he is capable of making an impact as he enters the professional ranks. Whether or not McDermott is available when Chicago makes it picks (16 and 19), of course, is another story. Named the consensus National Player of the Year as a senior at Creighton, McDermott is projected to be a top 10 pick. When you look at his collegiate resume, it’s not hard to see why. The 6-8, 218-pound small forward led the nation in scoring at 26.7 points per game. He turns his attention to the NBA after ranking fifth in NCAA history with 3,150 career points, passing the likes of Larry Bird and Oscar Robertson this past February and March, respectively. Speaking of Bird, McDermott understands the comparisons were inevitable, especially after being featured on the Sports Illustrated cover, one which replicated the November 28, 1977 edition featuring the former Indiana State All-American. That won’t stop McDermott from doing his best to emulate the three-time NBA champion and Hall of Famer. McDermott watches Bird highlights before every game. Though he wasn’t old enough to see Bird play with his own eyes, studying his game on tape has helped him with his own. McDermott has worked to add a fadeaway to his repertoire, similar to what Dallas forward Dirk Nowitzki has mastered. And while like Bird, McDermott has proven to be a prolific scorer, it is some of the other aspects he tends to focus on when watching the former Celtics star—being a great teammate, making an exceptional pass, and possessing a high basketball IQ. 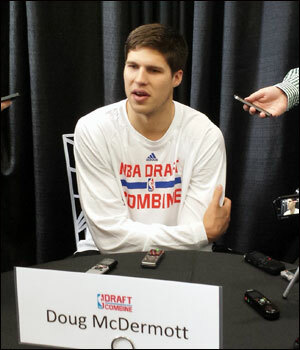 McDermott is also often compared with former Bulls sharpshooter Kyle Korver. Both attended Creighton and possess the ability to impact a game from the behind the arc. McDermott has talked to Korver about his NBA experiences, particularly his two seasons in Chicago. Training in Chicago with fellow draft prospects Nik Stauskas, Joe Harris and John Kilpatrick has allowed McDermott to take a closer look at the Bulls. A high school teammate of Golden State forward Harrison Barnes in Ames, Iowa, McDermott believes he is best suited to play an up and down style of game, much like the one employed by San Antonio. “The Spurs, that’s who everyone on Creighton dreams of playing for because we kind of play the same way,” said McDermott. “But I think a lot of teams are starting to move in that direction. I think the Hawks and Suns are starting to play like that with a lot of shooters and spacing the floor. While McDermott’s shooting abilities are undisputed, as he attends workouts for various teams he has other strengths he is hoping to showcase. As for what he’s trying to improve upon, McDermott is working on his lateral quickness, knowing it will soon be time to defend NBA shooting guards and small forwards. He acknowledges teams are asking him about his defensive abilities, and while he admits he won’t ever be a lockdown defender, he feels he’s capable and smart enough to get by. “I’m a guy that hates getting scored on,” said McDermott. “I’m really competitive and I take that stuff to heart. Throughout the course of an 82-game season, you’re going to get scored on your fair share of times. You’ve just got to make sure you’re giving your best effort every time you’re asked to guard someone. Bulls.com was in attendance at the NBA Draft Combine May 15-16 in Chicago and this is the third in a series of looks at some of the projected first round picks. The Bulls currently own three selections in this summer’s June 26 draft—16th, 19th and 49th.